Making buying memes a meme. We were inspired by the real stock market. We wanted to apply the idea of the stock market on a familiar, but different, topic. The unpredictability and constant live updates of the stock market was something that we wanted to replicate in our project. The name of the game is to buy low, sell high. The page accesses a random meme from a variety of random subreddits and displays its picture, its value and its title. The value of the meme is equal to the upvotes over time elapsed. The user can either buy the meme and increase the money in their portfolio, or pass the meme. As time goes on, the value of the purchased memes, which appear in a table on the right side of the screen, changes as the value changes. 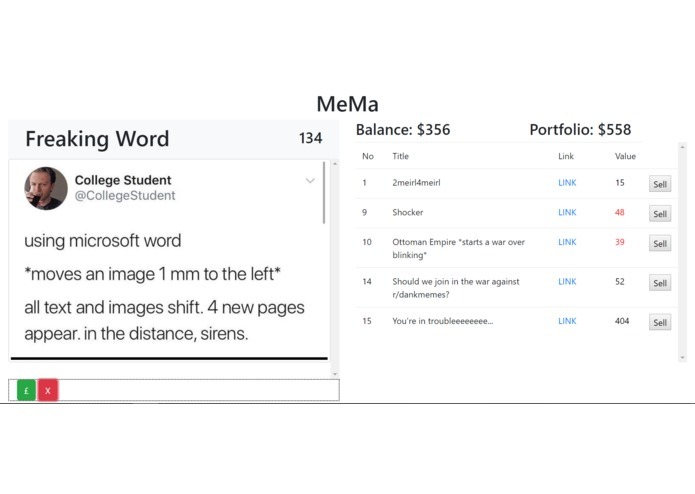 Once the user has purchased a meme, its value is stored in their portfolio and they can sell it and therefore add the value to their balance. Reddit did not allow us to remotely access json. We fixed it by using jsonp, instead of json to access information on reddit. Live updates of data according to reddit upvote count. Learnt how to use the reddit API as well as the issues with Cross-Origin script execution, and JSONP.